As I sit at home on Boxing Day evening writing this I can safely say I had a wonderful Christmas holiday. From the moment I woke up on Christmas eve it has been one festive event after another. I have entertained… A lot! My favourite pastime. Christmas eve was one long succession of guests. Serena came for breakfast, Steve’s mum and dad came for lunch, Alex arrived in time for afternoon tea and my sisters and Tim popped along for Christmas eve drinks and nibbles. Christmas eve was definately an open house kind of day. I did manage to pop out in between all the entertaining for a short while to take in a bit of fresh air. I tend to get a little stir crazy if I am cooped up inside all the time. To get out in the cold air and take a walk around the block was just what I needed. Christmas morning I woke up with the lark as per normal. I am always up before everyone else. I’m an early bird you see. I get so much done in the morning when I can be on my own. I prepared breakfast for Steve, Alex and myself and got the Christmas table ready. I also managed to get a start on our Christmas lunch which was such a good idea as it meant I could spend more time having fun later on. We had a spiced plum parfait followed by warm croissants, cranberry loaf and crispbreads. I served a wonderful selection of jams and marmalades that were either homemade by me, friends or by local artisans. There were a few cold cuts left over from Christmas eve lunch too.. I knew Steve would enjoy those. Waste not, want not is a motto in our house. After breakfast we opened the champagne and settled down around the tree for the present opening. Sicily the kitten had to get involved of course! After the presents we decided to take a walk to The City Gate pub to have a Christmas drink. We took a slight detour to look at the cathedral on the way. The pub was full of diners enjoying their traditional Christmas lunch. All the while I was pleased that we would be going home for a quite different type of feast. I had settled on roasting a side of salmon with orange lemon, currants and spices such as clove and nutmeg. There was a final festive flavour with stem ginger in syrup. With that we had a pearl barley salad with roasted carrots and fennel (the recipe will be posted very soon) and a roasted sprout,pea and savoy cabbage medley.. Again, all lightly spiced with Christmas flavours. For dessert I had made a wonderful rose jelly and served it with berries. The recipe for this will be posted shortly too. After our late lunch we played a few board games.. Cluedo was the first. Alex won much to Steve’s disgust and then it was onto “Name that tune” 80’s edition. Thankfully Steve won that time! At this point I tootled off to the kitchen to prepare our cheese course. We had a vast selection that I popped onto one of my favourite vintage platters. I opened some fancy cheese biscuits and got out the huge selection of chutneys that had made their way into my kitchen cupboards over the past few weeks. 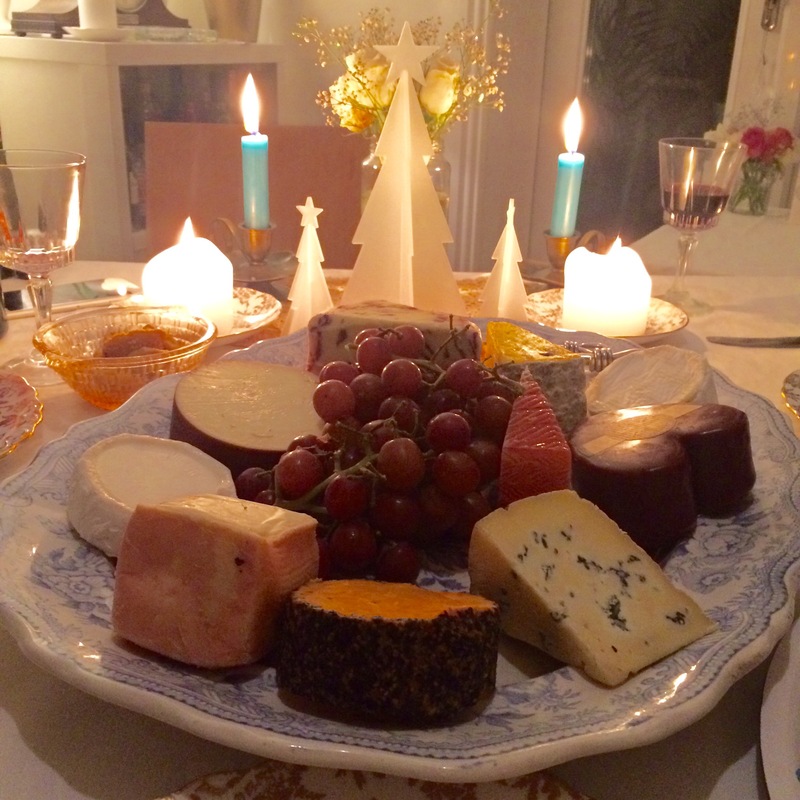 We spent the rest of the evening chatting, watching Strictly Come Dancing and consuming lots of lovely cheese. Yum! Boxing Day was the day that I needed to move! I had felt a little housebound over the previous two days and I needed to blow the cobwebs away. We hopped into Alex’s car and drove up to Dartmoor. HayTor to be exact. We donned our wellies, warm coats, hats, scarves and gloves then marched up the Tor via the reservoir. It was blowing a gale and was pretty chilly but we all commented on how it made us feel so much better. I almost got blown over twice! We found some beautiful yellow roses by the reservoir. We came up with lots of reasons why they might have been there. Some sad and some more hopeful and beautiful. I will leave it up to you to decide why they might have been there. We also found some festive Christmas decorations in one of the trees. That made a chuckle. Someone out there has a sense of humour. I wonder if the roses and the decorations were connected? After our bracing walk we headed over to the Rugglestone. A pub a short drive from HayTor that I would highly recommend. I probably visit the pub three or four times a year but I am never disappointed with the welcome or the food. Portions are massive so make sure you take a walk on the moors to build up your appetite first. If ever you decide to give this pub a visit make sure you book. It’s pretty tiny inside and ALWAYS rammed. I had smoked trout with new potatoes, coleslaw and salad. Steve had the luxury fish pie and a side of chips. Alex had haddock, chips and garden peas. All fantastic by the way. We decided on sharing two desserts between the three of us. Treacle sponge and custard. Apple and mixd berry crumble and clotted cream. Again, both were fabulous. So, that is my Christmas holiday round up. A wonderful three days of sharing good food and laughter with the people I love and care about. What more could a girl want? I hope you all had a wonderful time this Christmas and are looking forward to the New Year’s Eve celebrations as much as I am. Steve and I are off for dinner at my absolute favourite pub in Exeter, The Hour Glass. This will be our third New Year’s Eve on the trot and I hope it produces as much fun as the previous years. I can’t wait to tell you all about it!